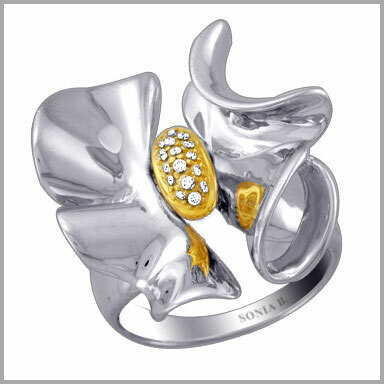 Sterling Silver / 14K Gold Diamond Contemporary Flower Rin.Price includes 30% discount. Slide on this bold design with modern flair for a look that stands apart. This contemporary flower ring is crafted in polished sterling silver with a center that shines with 14K yellow gold. It shimmers with 16 full round cut diamonds in prong settings. The total diamond weight is approximately 0.08ct with a color of H-I and a clarity of SI1-3. The setting size is 7/8" x 7/8" with a height of 3/8".